This was not the post that I meant to write today. If you’ve read my blog at all, you probably know that I’m not one for emotional confessionals. However, I read about a study today that had me questioning my identity, my self-worth, career choices, and reproductive timeline. Is this a little overdramatic? When I was in my twenties, here was my plan: 1) Win a fellowship to a phD program 2) Get phd in sociology 3) Get married 4) Get tenure 5) Become a published writer 6) Have children. Here’s what actually happened: 1) I won a fellowship to a phD program 2) I dropped out because I was still going into debt and missed my friends in New England and just wanted a simple break from school 3) I finished my master’s and became a teacher 4) I went back to graduate school after a successful career in teaching 5) I got married and began my dissertation research 6) I had a baby 7) next steps: unclear. I wouldn’t recommend going to grad school, especially a phD program as I did, straight out of college. You need time out of school, to be a young adult outside of an academic setting, make some money, get real world work experience, figure out who you are. But what happens when women “take a break” from academia and then return? Nothing good, it turns out, for women. Your timeline doesn’t align with the schedule of developing an academic career. You meet the dreaded biological clock. You are not viewed as a serious researcher, a serious scholar, if you’re navigating between the worlds of diapers and data. You are told that pregnancy doesn’t mix with academic conferences, job interviews for academic positions, and even data collection. So what do female academics do? They drop out entirely, as I did. Did I destroy my options by waiting too long to have a baby? Should I have just stayed in a doctoral program as a twenty something, despite not being sure about it? Ultimately, I don’t really regret my choices. I’m probably happier and better suited to writing and to life outside of academia. But I’m angry that my experience was not some weird fluke. New parents — women and men — need so much more support. They need, as Mason concludes, flexibility in being able to re-enter their careers. They need policies that provide a flexible workplace, flexible leave policies, and assistance for day care. Because ultimately it’s not just about personal choices; we all make choices in the context of so many other factors. We need a world where our personal family choices are supported by our workplaces, whether they are a factory, a university, a corporate board room, a hospital, or our home computer. How could your workplace have supported you better during new parenthood? I’ve been pretty lucky. As I mentioned on FB, my first was during my post-doc and the timing worked well. My second was in my current industry job. I didn’t leave academia because of kids per se, more just that it wasn’t the life I wanted. I wanted a career, but not one that was my life, was as consuming as a tenure-track position. In industry (I’m a scientist at a biotech), I’m able to throw myself into research and not worry about grant writing and tenure. I have paid vacation and while I am careful how I use it, I use it! With a few necessary exceptions, my nights and weekend are my own. Whether I had kids or not, a tenure-track position was not what I wanted. As a sidenote- my grad adviser never had children (I don’t know why). However, she was very supportive of people who did. Generous with maternity leave, etc. She even arranged for a post-doc to finish her work and then take an extended ‘leave of absence’ from her job. She was adopting 2 children and used the year and half ‘leave of absence’ to stay home and help them transition. At the end of that time, she was able to start job hunting, and her resume showed no interruption in her employment. Technically she had still been employed as a post-doc (just on a leave). I wish more bosses were like my adviser. Momma, PhD recently posted…My superpower: I can hover 10^-8 meters off the ground. Your adviser sounds terrific. I know that they do exist! My second adviser was amazing, completely supportive. I finished out my dissertation with him. He had four kids (that he stayed home with part-time) and I think that this had a lot to do with it. Maybe in the sciences there are more opportunities for “academic-like” jobs. Post docs and those types of research jobs outside of academia are rare in the social sciences/humanities. Jessica ~ I just read Quiet based on your post a few weeks ago, and then started Lean In yesterday! Anyway, I totally agree with this: parents “need policies that provide a flexible workplace, flexible leave policies, and assistance for day care.” I was lucky to be able to combine summer vacation (as a teacher) with my leave, and had great support from my employer, but I think it is horrifying that we are the only industrialized country that does not mandate paid parenting leave…. And we need to start viewing daycare in this country not as a service for working parents, but as a fundamental part of early childhood education for children. We need much more affordable, safe, and nurturing childcare options…. Great post about some important issues. I’m glad you are happy with your choices, but yes it is frustrating that these are always seen as issues for women and not men. I’m so glad you read Quiet! Wasn’t it terrific? I completely agree that our view of child care needs to change completely. The way that the United States compares to other countries in terms of child care (its quality, funding, etc.) is shameful. Just shameful. At the bottom of this (in my opinion) lies the disregard we have for the well-being of children in our country. If we were to put their needs in the forefront some of the issues you brought up would sort themselves out. I’m not done thinking about what you wrote- very though provoking Jessica. I know, and it’s so easy to blame yourself personally for not being able to do it all. Sometimes I do feel like a failure because I wasn’t able to manage having a top notch academic career at this point. But the truth was that maybe I could have if I had been given more support in many different ways. A great post that hits home for me too! In my opinion, the best thing employers could do to support working parents (after paid family leave, dedicated pumping rooms for breastfeeding mothers, flexible work arrangements and quality child care assistance) is to offer engaging part-time work as an option for parents who want to “lean out” for a while but not leave entirely. I am a mechanical engineer and mother to a 2.5 year old. I would love nothing more than do work part-time at my job. I enjoy being an engineer and think I’m a better mother when I work. Many of the other working professional parents I interact with have also expressed a desire to work – just not so much! I completely agree. 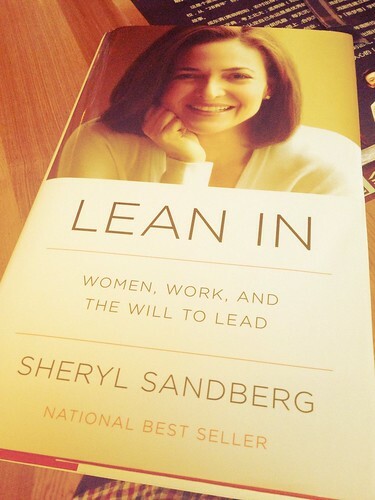 Women should “lean in” and then be able to “lean out” (great expression!) if that feels right for them and their families. Full-time work (especially with two parents) is just so difficult for young families to manage, but many women don’t want to leave the workplace entirely. Our country’s work hours are just insane… It’s unsustainable for many families, I think. Interesting twist on the whole Lean In conversation. When people think Lean In, they think corporate America, not academia. I guess it turns out that our society derails women’s careers across the board. I like your choice of words about your adviser not being “impressed.” It’s like you were disappointing her and all women by having a baby. So discouraging. The ironic thing is that I wrote my undergrad thesis about the transition to first-time motherhood in the mid-1990s. Every single woman in my study either decided to stop working after their babies were born or cut back their hours drastically on a planned permanent basis, despite the fact that most of them had intended on working after a maternity leave. When I found out I was pregnant, I remember feeling so relieved that the working world for women had changed so much during the past decades. Turns out, not so much in most career fields. We need to write a group book on this. Yup, sounds familiar (well not the Ph.D part, but the rest of it). I have long struggled with this little fact of life & it doesn’t really matter what line of work you’re in, if you’re a woman & you have a baby, you’re penalized in this society. I went to grad school pre-baby, but my mom got her masters while my brother and I were both little. Looking back on it, I don’t know how she did it! You are my hero for getting your PhD and being a mom! And it seems like you are absolutely figuring out a path for yourself career-wise! I’m sorry that it is so tough, though. It really is so amazing to me how contradictory AND hypocritical the world of academia can be. I dropped out of my Literary Criticism program as an undergrad because my advisor told me I wasn’t going to go anywhere because I had no passion. This was based on the fact that I wasn’t a feminist and I was only mildly interested in global women’s studies. It didn’t matter that I was passionate about Baudelaire, because in her eyes that was not where a young woman should focus her attention. I do regret my decision…But when you are relying on the people who are supposed to be your mentors to make it through, where do you go? I am glad you are writing, because now I get to know you! I was in a lawsuit with my employer at the time I became pregnant. Soooo they had to stay on my good side … muwhahah. You’re so right! I can definitely get on board with the idea of “leaning in” — in my own head. But the actual physical day-to-day reality just makes me tired. So fascinating, important and infuriating! One day when we meet we’ll share some stories. This topic hit really close to home. I admire your ability to discuss such a variety of topics, yet always staying true to your tone and the spirit of your blog. Reading you is a treat. Thank you, Katia! Yes, somebody we should definitely share some stories. I would be so fascinated to learn more of yours! I am getting ready to head back after being home with my son. Teaching isn’t a job I was able to leave at school before having my son. There were hours of work to be done almost every night. Finding a balance that works for doing my best at school and home will be a challenge. First, Happy SITS Day! I hope it’s an amazing one! Second, I have only worked one job outside the home since I have had children. It was a job (financial secretary) that was very part-time, I could set my own hours and even do part of it from home or bring the kids with me if I needed to. It was great and I loved the work, but ended up leaving in the end because of personal reasons and I don’t look back, though I would definitely consider getting a degree in accounting now and may even go for that sometime in the future when the kids are a bit older. I did, however, work as a daycare worker throughout college where we took care of kids for lots of moms/parents who worked and I heard over and over again how they felt forced to choose between special child events (sports, recitals, birthday parties) and even every day things (grocery shopping) and work. I even had one mom in particular who brought her daughter for a week with over 104 temp (she brought her in doped up on Tylenol/Advil so she was “fever free” in the morning) and left her there all day (despite our calls to her and her hubby – he was in the same boat) because she would lose her job if she stayed home with her child or left early to get her from daycare. That right there left a very bitter taste in my mouth for most places of employment, not just academia. You’re so right, new parents need so much more support. I think I am doing my best by my children in being home with them during this time, I love the opportunity to speak directly into their lives too, but somewhere behind me, somewhere IN me, there is a sense of displacement of neglected skills. There was no way I could be the hands-on mom that I am now, as well as be the UN officer that I was, interviewing asylum seekers and processing asylum claims. And it would’ve been impossible to do it on a part time/work from home basis. We absolutely agree that academic mothers need more support, and our book describes many ways of providing this support. Leveling the playing field is both the right thing to do, and will keep America more competitive by strengthening our academic workforce.